New, nearly new & used computers for a fraction of the cost. You will be pleasantly surprised by the amount of computer you get for the money at Sarita Computers. We are a Microsoft Registered Refurbisher and focus on new & used computers; Ex-Lease and Surplus computers; and custom built systems. It means that you’re able to get the computer you need at the price you were hoping for with a fresh copy of Windows and our full software pack (Office Productivity Suite, Antivirus, etc.) and our industry leading warranty. What more could you ask for? Our philosophy since we opened our doors 10 years ago has been to provide the computer you need rather than the latest greatest cutting edge technology. Don’t get us wrong, if you’re looking for the latest greatest we can provide you the most amazing computer at extremely competitive pricing, it’s just not for everyone. 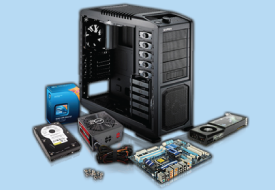 If you’re looking for new & used computers, Sarita Computers is your number one choice. Contact one of the Sarita Computers Team members today and find out how far your dollar can go.